Greystone Studios has published these comics and coloring books. All comics are available online or can be bought directly from me at conventions. Back in the third installment for 2016! The Cosmosaurs find a peculiar animal shelter on the planet of Mars that might just hold the secret to the whereabouts of the Hovercat. There’s only one problem. An alien vampire pig. Fun and educational, this pun-filled collection features some popular dinosaurs — plus recent discoveries! T. Rex, Triceratops, and newly discovered dinosaurs like Aquilops, Tarchia, and Prestosuchus! Includes fun facts about each dinosaur, as well as visual puns and geeky references. 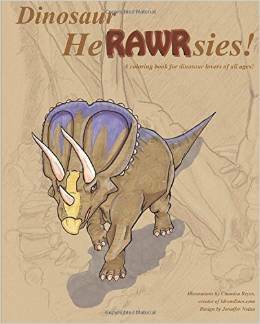 A fun coloring book for dinosaur fans of all ages! 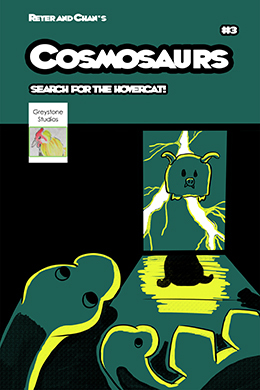 Cosmosaurs #1 – Search for the Hovercat! The Cosmosaurs’ tracking signal lead them to a seemingly desolate and uninhabited planet. Is this where their friend the Hovercat has been taken or is it just a trap? Cosmosaurs #2 – Search for the Hovercat! The Cosmosaurs uncover smuggling operations on Mars. Is one of the crates of smuggled goods, their friend Hank? Or will the Pirate Penguins of Polaris Australis successfully get off planet with their goods? Short Toriis has Short Stories! Two all-ages stories, “Hop Haap” and “Socks & Violence,” are collected in this digest-sized mini-comic. “Hop Haap” tells the tale of a Chinese Hopping Vampire and his pet bunny, while “Socks & Violence” explores the mysteries of unmatched socks. Limited availability at some conventions. The Mighty Invincible Bear is a digest-sized mini-comic suitable for all ages. In the three collected stories, a brave but cuddly bear faces three different foes in three different genres. The ending reveals the true nature of the bear and his importance in his particular world.